…so the bubbles are to reignite the joy and to surround you with so much playful joy that you remember that you are a sweet angel in form and that you have come to this incarnation, into this magnificent form called a physical body, that you came here to play…Take my golden bubbles and beloved ones, in your peace meditation tomorrow night send them all over the planet, let the planet and every being upon the planet be covered and playful and joining in the game of the golden bubble. We will join you. Greetings, I am Gabriel; I am Gabrielle, Lily of Love, Trumpet of Truth, Messenger of One. Welcome, welcome my beloved family, my friends, sisters, brothers. Finally! I am given this opportunity to speak to you and I will tell you why, it is because I bring a Christmas present; I bring you the blessings and the gifts of the Season. I bring you my love and I bring you my radiance, but mostly, dear heart, I bring you the gift of my joy. Years ago, and actually in 1997, I have given you the gift of my Golden Rain. It was an important gift at that time and I have never stopped sending it to you. But many of you do not know this and some of you have forgotten. So, I remind you…it was simply a beautiful, wonderful light shower where every molecule of that beautiful water was gold. And in that I simply drenched you, covered you, penetrated you with my joy. Well, we build upon that this day because what I bring you as my present, as my gift, to you, my beloved angels, is my gift of Golden Bubbles. How much more playful can you get? You do not need to get wet in order to get penetrated, although you can if you want! Now, how does this work? All of you have images or have played as children, as young ones, which by the way you still are, particularly when you are compared to me. You have seen children blowing bubbles and they glint and they shine and they float and they’re not only joyous and fun, they are beautiful. And we have used this analogy and this tool of bubbles, as the Council of Love, for a very long time. And one of the first things that we have ever spoken of to you is to insure that you stay within your bubble, your Seal of Solomon, and to know that that bubble has always been permeable; that love and laughter and tenderness and sweet mercy could enter within. But nothing that was not of the highest vibration was allowed admission and that your sweet love could travel far and wide without. Well dear hearts, look how your bubble has grown. It is not only magnificent and beautiful, it is significant. But this is not simply the bubble I bring you this day. I want you to think, as you sit there relaxing back into my arms, that you are blowing bubbles and that they have landed and they are all gold, they are transparent, but they are gold and they are simply landing all over you until your feet, your legs, your arms, your entire torso and your head, that you are in a bubble cocoon. And there are a million striations of gold that are surrounding you. But I also wish to tell you how this gift can be used: It is a reminder, it is not simply one of my gifts of joy and it is not a gift of joy that is external to you. Just as my rain has ignited and reignited and then reignited again the joy within, so the bubbles are to reignite the joy and to surround you with so much playful joy that you remember that you are a sweet angel in form and that you have come to this incarnation, into this magnificent form called a physical body, that you came here to play. Yes, you came here to play in service to the Mother. It was not meant to be drudgery; the Mother did not say to you, “Oh, I have a kitchen to be cleaned or a dungeon to be redone, can you go down to Gaia, who used to be one of my mightiest archangels, and still is, and clean her up?” No, that was never the plan and in fact, my sister, Gaia, would be very upset and a little disturbed to think that’s how you perceived her. Oh, have you dirtied up the house while you’ve been there playing, creating illusions and doing all kind of things? Yes. And is it responsible and loving to clean up some of your mess before you leave and ascend into different dimension? Yes. But does she require it of you? Does the Mother above or the Mother below require it of you? No. You do it out of love but you only do it out of playful love, out of joyful love, out of passionate love, out of sweetness. When you do it from a sense of dark responsibility and drudgery, then all you are doing child is adding drudgery and lower vibration to the planet. And, quite frankly, she doesn’t need it and neither do we and you most certainly do not. So, I give you these bubbles to play with, to blow and make float because they float up high into the sky, it brings cleansing joy to the air. Push them out into the ocean, to the lakes, to the rivers, to the streams, let them pop and flow into the water; let them land on the trees, the deciduous, the evergreens, the Christmas trees. Decorate your Christmas tree with golden bubbles; give them as Christmas gifts, but mostly sweet angels, give them to yourself. The bubble is a sphere, it is an orb, and it is the form in which you most often perceive us. Many of you have said to us, “Gabriel, Gabrielle, Michael, St. Germaine, when am I going to see you?” And the thing is is that what you are doing, and we do not chastise thee, we are just saying, what you are doing is you are looking for a human form to appear somewhat before you. Now, that is not that this will not eventually happen. But what you tend to see in terms of the general population, the form that we take, that we show up in your photographs by leaps and bounds is as orbs, is as these beautiful bubbles, and if you look more closely you see the colors, but not only do you see the colors and our rays, you see and you’ll notice in your pictures that this has changed recently, that you begin to see the patterns within the orbs and that is our soul design, it is our eternal essence and we are beginning now to share that with you more clearly. Look at your pictures. But the reason that we are in orbs is that they are self-contained, they are spherical, they are impenetrable. Now you are having a clearer understanding when we say, “Stay in your bubble.” They are impenetrable and we can float throughout the multiverse and visit wherever we wish. So that is a form that is very common and that you can see at any given time. You also often see us as a beam of light, but I do not wish as yet to get off the topic of my beautiful bubbles. They are round, they are circular, they are spherical and what does that mean dear heart? It is a reminder to you that there is no beginning and there is no end. It is all united. And when you stand or sit or lie in a bed of bubbles, of millions of bubbles of every size, with every shade of gold, you will be reminded…you are a bubble, you are a sphere, and while maintaining your physical form you are free to hop aboard and to travel with us throughout the multiverse, throughout the 12 dimensions and 12 planes. You are free. And can you think what it is like to be traveling inside an unbreakable bubble? How much fun that is as you roll along the ocean waves? Or float across the Big Dipper as you wave to your star brothers and sisters? As you alight with the fairies on a lily pad? Take my bubbles, my golden bubbles that remind you and restore. Yes, the Mother has said, “This is a time of recovery, restoration, renewal.” December is truly the “r” month and do not forget revival, revelry. Know that I am with you and I am with you in my gift of joy. 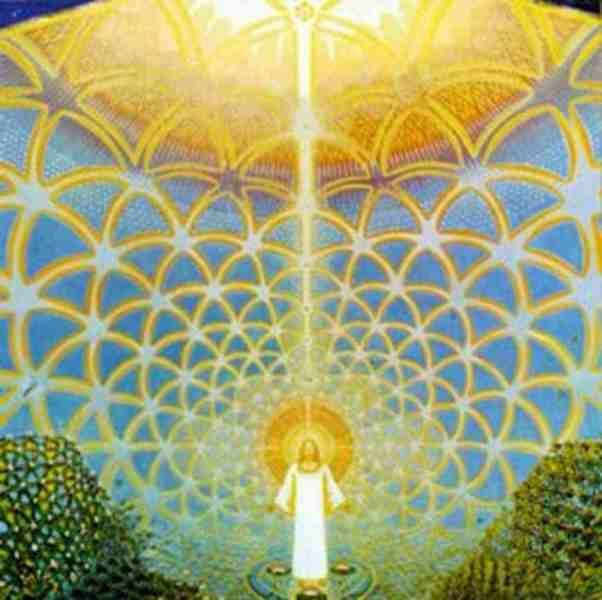 Take my golden bubbles and beloved ones, in your peace meditation tomorrow night send them all over the planet, let the planet and every being upon the planet be covered and playful and joining in the game of the golden bubble. We will join you. Merry Christmas. Let this solstice be your turning point and let it be the return to joy. Go with my love and go in peace. Farewell.